Ganesha's Media Gallery - New Content! Ganesha, Ganesh, Ganapati, Pilliyar and hundreds more. Ganesha has the head of an elephant and the body of a man. He has a large belly and four arms. The symbol Aum, an elephant goad, a modaka sweet, the Hindu svastika, a broken coconut and many more. 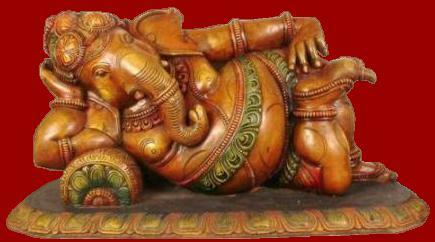 Ganesha Chaturthi: The birthday of Lord Ganesha, a ten-day festival in August or September. The devotees of Ganesha are known as 'Ganapatyas', (Sanskrit: गाणपत्य). Ganesha Purana, Mudgala Purana, Ganapati Atharvashirsa, Ganesha Sahasranama and Sritattvanidhi. There is a Ganesh statue made of 514-karat diamond in Pune and a five foot tall silver statue of Ganesha in Mumbai. One statue of Ganesha is adorned with over 60 kgs of gold and 175 kgs of silver. The tallest Ganesha idol, built in 2009, is 58 feet high. milk in front of millions of devotes throughout India and around the world.